Hyperink, a next-generation digital book publishing platform, has raised $1.2 million from Andreessen Horowitz, Y Combinator, SV Angel, Lerer Ventures, Launch Capital, Cyriac Roeding, Jack Abraham, and others. Simply put, Hyperink, which was a graduate of Y Combinator’s Winter 2011 class, wants to disrupt the book publishing world. The startup is a digital book publishing platform and full-service agency that will help any aspiring author write, design, publish, market, and sell a book without any up-front fees. Hyperink wants to represent the long-tail of book demand. As co-founder Kevin Gao explains, traditionally, the publishing industry is very hits-driven and slow. With Hyperink, he explains, people can create books that are far more niche and targeted, and do it ten times faster than traditional publishers so that the information is the most current and relevant. Another way that Hyperink is looking to disrupt the industry is sheer cost. With big publishing houses, books cost tens of thousands of dollars to produce and market, and take 16-18 months to publish. Hyperink’s books production costs are under $1,000 on average, and are published in under a month. 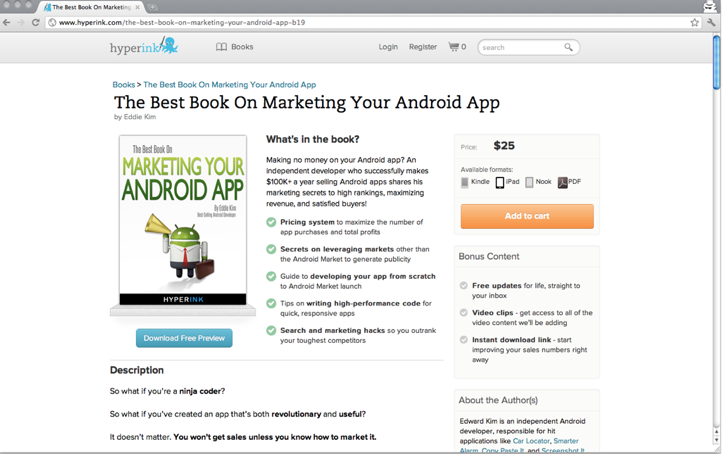 For example, one Hyperlink’s top selling books is “Marketing Your Android App”. The expert and author is Eddie Kim, who has successfully built and sold 6-figure Android apps. He spent under 10 hours working with Hyperink’s journalist team to produce a book, and it’s already profitable. Authors can write their own books, in which case Hyperink uses its publishing platform to go from manuscript to “for sale”, providing editorial support, cover design, layout, content advice, etc. Hyperink also provides it own marketing channel and will publish to platforms like Kindle, iBooks and Nook and provide marketing support through search optimization, social media, and email. If you don’t have the time or interest in writing your own book, Hyperink pairs you with a ghostwriter who will interview you and then write the whole book, with your input and editing. Of course, Hyperink is taking on Amazon, who is already launching its own army of publishing imprints as well as self-publishing options. But there is a wave a disruption that is already taking place in book publishing world and if Hyperink can attract high-quality, niche content, it could be a compelling player in this space.